August 23, 2007, I wrote an article on footnoteMaven about a photograph I had purchased titled, Finding That Two Hundredth Edwardian Woman In A White Dress. 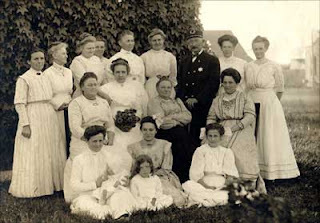 It was about a group of women and one man called the "Birthday Club," Lamoure, North Dakota, September 2, 1911. Each person in the photograph was researched and a small window about their life was written using only the census. A photographic key was created and included here on Shades in the Labeling and Labeling Systems article. I lovingly call this photographic research method the "Birthday Club Method." You just never know what may pop up when you google a name like KONOSKE. Robert and John Konoske were both uncles of my Grandmother Frances Pearl KONOSKE Wander. 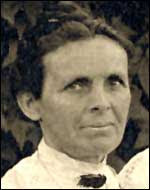 She was the daughter of Herman KONOSKE, a brother to the two men. 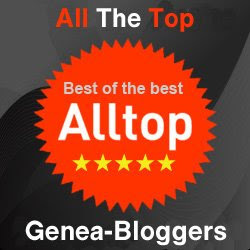 I am inspired! . . . . ."
Mrs. Robert Konoske is Mary Konoske. The 1910 census lists her age as 45 years old, however, the 1900 census lists her birth date as December 1863. This would make Mary 47 years old at the time of the census, not 45, and 4 months short of 49 in the photograph. This is the second marriage for Mary and the first for Robert. They have been married nine years. Mary has had seven children and seven are living. Her children are listed as Mary 20, Lizzie 19, Jacob 17, Martha 14, Edna 12, Robert 8, Florence 5. 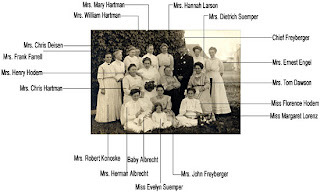 All the children are listed as Konoske, but it would appear that only Robert and Florence are Robert’s biological children using the fact that Robert and Mary have only been married nine years. Robert's occupation is a retired farmer. The 1920 census finds that Robert and Mary have taken in Robert’s widowed brother John Konoske. Mary, Lizzie, and Martha are no longer living at home. We now know Mary's previous married name, as Jacob and Edna are listed as Robert’s step-children and their surname is Schneider. Robert is now a wagon maker, the occupation of his brother John in the 1910 census. John has retired and it appears Robert has taken over the Konoske wagon making business. We find a Mary Schneider in the 1900 census. She is a widow with a farm and five children. They are Mary, Lizzie, Jacob, Martha and Edna. These are the same names listed for the children of Mary Konoske, so it is fairly safe to assume this is the same Mary. There is no Robert Konoske living in Lamoure in 1900, but there is a John who is married with several children. It is an assumption that as John Konoske and Mary Schneider were both living in Lamoure that they knew each other and that John introduced Mary to his unmarried brother Robert. By 1930 Mary is a widow living alone in Lamoure. It's All About The Connections! The Birthday Club. Photograph (Card Mount). September 2, 1911. Privately held by the footnoteMaven, [ADDRESS FOR PRIVATE USE,] Preston, Washington. 2007. The Birthday Club - Key. Digital. 2007. Privately held by the footnoteMaven, [ADDRESS FOR PRIVATE USE,] Preston, Washington. 2007. The Birthday Club (Inset Mrs. Robert Konoske). Digital. 2007. Privately held by the footnoteMaven, [ADDRESS FOR PRIVATE USE,] Preston, Washington. 2007. Another wonderful connection made! You inspired me with the "Birthday Club" post too - an incredible research job. The connections are what keeps me going. It's what makes it all worth the work. Isn't the internet a wonderful place? formed in 1910 in LaMoure. John Freyberger was appointed chief of police in 1910 and was known as "Friend of Children" promoter of city parks in LaMoure. Thank you for writing. I would love to have more information on one of my favorite photographs. Please contact me at footnoteMaven@comcast.net.